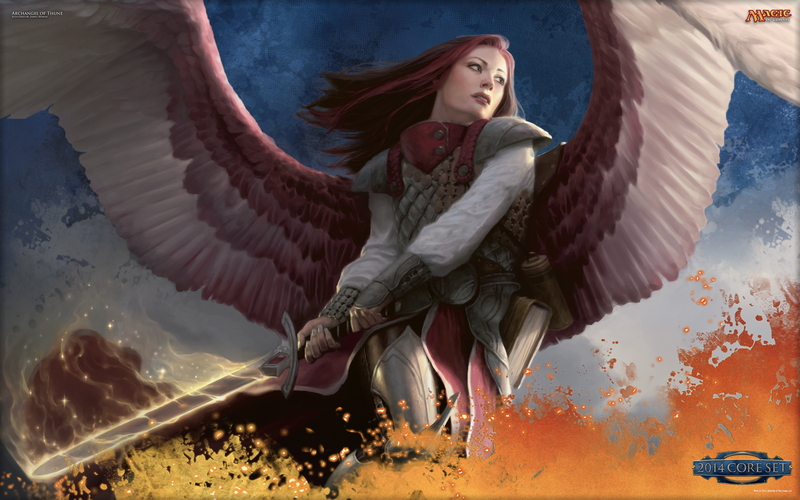 In the past couple of weeks, I and others have shared with you some advice on Theros block cards that are likely to go up during Khans of Tarkir block this coming fall/winter. We aren’t basing these cards on pure chance, but on a series of previous cards that have hit a low as their block ended, then rose during the next. Let’s go over a few of these so you can see trends to look for. I’ll be using the initial price, the 9-month price, the 14-month price, and the 2-year price. We are almost to that two-year mark, and as we get closer, prices will go even lower as the card prepares to rotate out of Standard. Remember, all you have to do is set the slider to look into a card’s financial past. While this cards exemplifies the trend I’m talking about, it’s far from the only one. 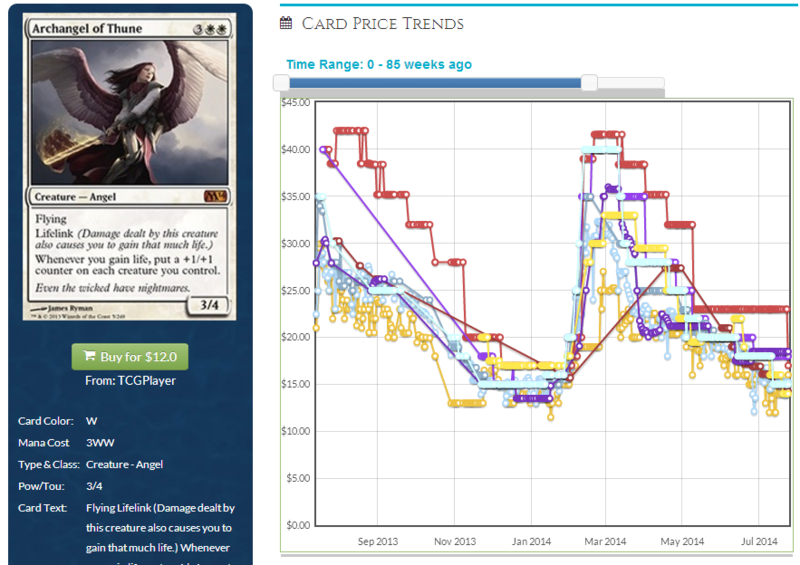 As a planeswalker, Jace 4.0 had a high initial and preorder price, which lowered over the course of the block. He was an easy pickup at $8, and when he spiked, there was a lot if money to be made. Both of these cards, as well as Underworld Connections, benefited from the rise of black devotion decks, and the reach of Gray Merchant of Asphodel. Pack Rat was a bulk rare, notable only for how impossible it was to beat in Draft or Sealed formats. Demon’s price was often lower than $3 because of the tokens everywhere his first year, especially off of Lingering Souls. When these two hit, they hit big. They are back to a low price now because there’s no home for them in Modern, and there isn’t enough casual appeal to maintain the high price. Remember, you always want to sell into the hype. Don’t get greedy. If your $2 card hits $7 on buylists, sell or trade them all. Don’t agonize over feeling like you might miss more profit–take your profit and be happy. Just look back at Jace, AoT. He spiked then trickled down for months. I don’t have a lot of money to speculate with. I prefer to trade, not purchase, but when I have a dozen that I traded for at $3 get to a buylist price of $5, that’s a really good feeling. There’s a chance this starts creeping back up, because Modern might utilize this over Wrath of God. Keep in mind that this was the buy-a-box promo, so the supply is slightly higher for casual players. Domri, as a three-drop planeswalker, has mountains to climb. Cheap ‘walkers can rarely protect themselves, but he can grind out advantages, and his interaction with Courser of Kruphix led to his abrupt spike. It’s amusing to me how much this and Xenagos both want to be in all-creature decks! This was another card that went crazy with the premiere of the Devotion mechanic. It fit into the mono-black AND the mono-blue lists, both of which surged in popularity, and are still among the top archetypes. Being the Release promo didn’t make a difference to the price at all, something to keep in mind when a card is spiking. Notable about this card is that there was a window between devotion being spoiled and this card exploding. This is why spoiler season brings out all the speculators, for good or ill. Boros Reckoner hasn’t made the same sort of impact, mainly due to the colors. Blue wants Thassa to be a creature and Master of Waves to make lots of tokens. Black wants the biggest Gray Merchant of Asphodel effect. Red does have the Fanatic of Mogis interaction, but that hasn’t proven to be as strong. These last two cards, being part of Core Sets, have a shorter time in Standard, but the curve is apparent. Started low (especially for being a reprint of a $40 card) then got very high as all sorts of decks started including the best ‘man-land’ ever, and is trickling downwards as we near rotation. It sees some Modern and Legacy play, mainly in tribal decks, but not enough to justify too high a price. It’s a tribute to the consistency of Temples and shocklands that three-color control decks would run a few of these, often as an answer to opposing Mutavaults, but wow. Colorless lands in a three-color deck! There has been a real rollercoaster on this card in the past year. As a mythic of a very popular tribe, her price is never going to be very low, especially at a measly five mana. She spiked when control decks boarded her in, a threat that grows and gains you life, and tricks with Mutavault help too. These are only a few examples. There are historical ones too, but we need to keep an eye on what Magic is now, especially in terms of the number of cards printed. 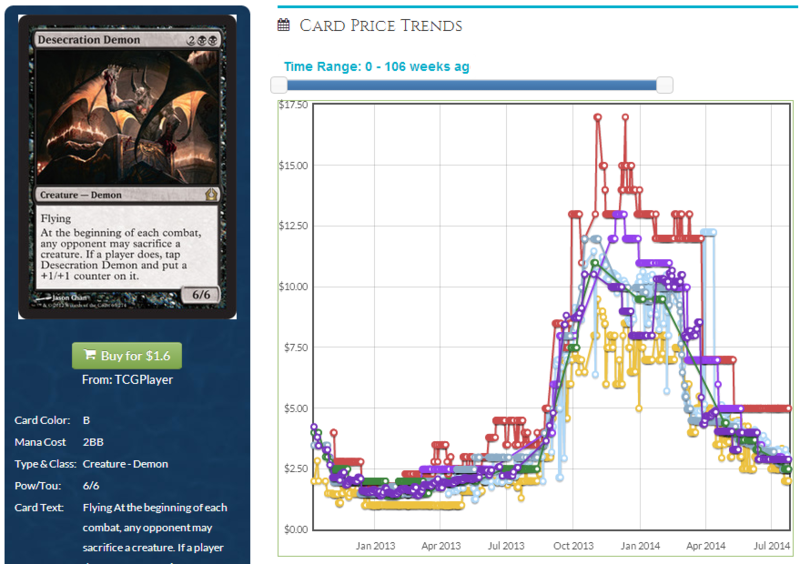 I hope this helps you think about and identify the same trend in Magic 2015 and Khans of Tarkir!